The ESP8266 has exploded in popularity since its introduction a few years ago. 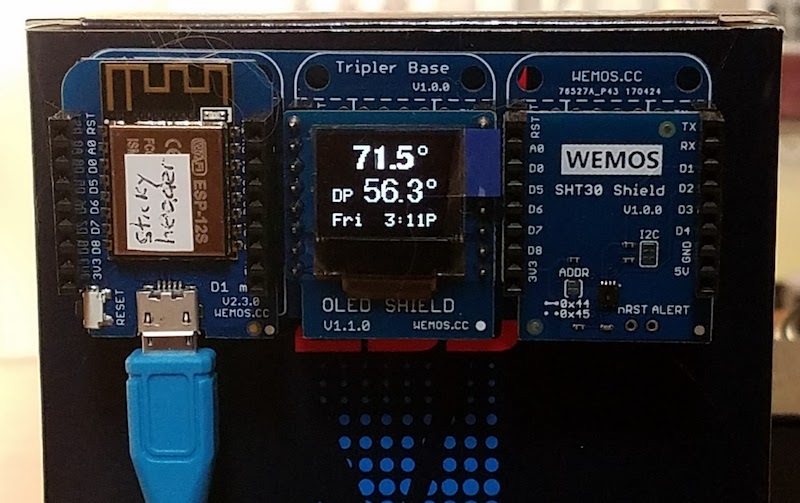 With easy to use Arduino-compatible modules like the Wemos D1 Mini, it’s like having an Arduino that’s 5-10x faster, has 128x more memory, and has built-in WiFi, all for the ridiculously cheap price of $4. It’s pretty amazing stuff, really. That’s great for a few minutes of work, but how can I make a single page that shows data from many sensors? Or historical data showing the temperature trend over the past 24 hours? Or a more attractive visualization UI than plain text? Or bidirectional control – the ability to switch some equipment at the sensor on/off? 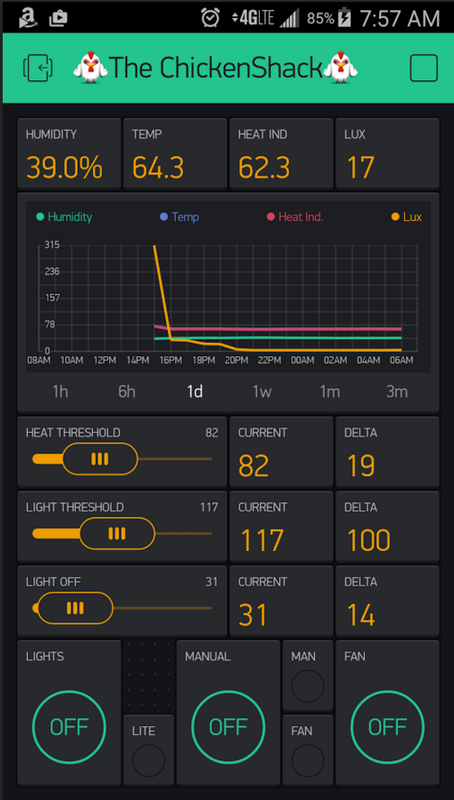 This is the realm of IoT data logging and display dashboard solutions, and there are many options. One approach is to run a local server to do the job, like a Raspberry Pi or an old PC. There are lots of options for software packages you can install on the server, which will log the data and serve up nice-looking pages to visualize it. I didn’t explore this route, because I was too lazy. I also dislike the idea of connecting to a random 192.168.1.8 server address that changes every time my home network reassigns the address through DHCP. I’m sure there’s a way to give it a fixed address and name like “weather-info.local”, but I didn’t look into it. There exist a dizzying number of cloud-based logging and visualization solutions. My ideal solution would would have a nice-looking historical graph of the data, with an adjustable time scale, like the example below from Weather Underground. And of course it would be easy to integrate into my ESP8266 software, and cheap or free to use. I’ve yet to find any solution that I love. Here’s a quick run-down of the cloud-based options that I investigated. 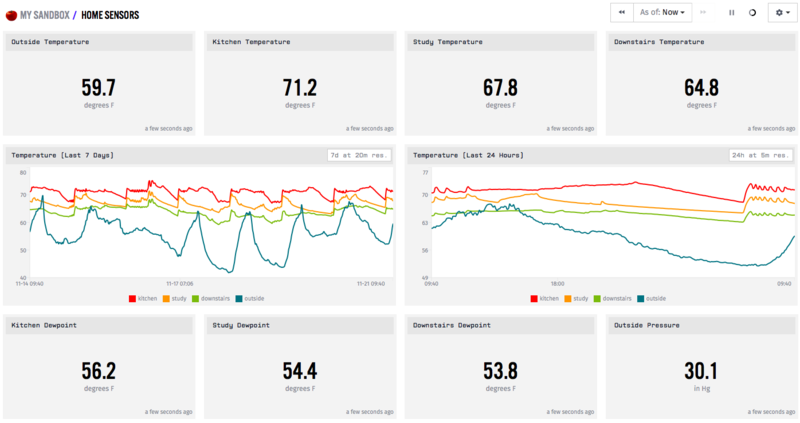 Dweet.io is the data logging service, and Freeboard.io is the dashboard display service. Judging from how frequently they’re mentioned in tutorials and instructables, they’re quite popular. You can also install Freeboard on a local server if you prefer. This setup is for data visualization only, and doesn’t allow for control over the sensor device. The combination of Dweet plus Freeboard is easy to use, and it looks nice. It would be a great solution except for one shortcoming: there’s no real support for historical data. Freeboard can display sparklines, which are a sort of mini-chart where nothing is labeled and the history is retained in the chart widget itself. Close the web page and re-open it, and your history is gone. There is an option for a Historical Graph Widget in Freeboard, but it requires upgrading to a paid Dweet Pro account for data storage. That’s only $2/month, but as far as I can tell it means you need to pay before you can try out the historical graph to see if it’s any good. From the screenshots I’ve seen of it, the time axis isn’t labeled and the time scale can’t be modified. It also appears designed to graph a fixed range of historical data, like June 10, rather than a window like past 24 hours. Freeboard can be extended with plugins, and there are several attractive graphing plugins available. However, all of them appear to function like the sparkline, with the history retained in the graph widget instead of coming from the data source. There may be a solution to do what I need with Freeboard, but I couldn’t find it. 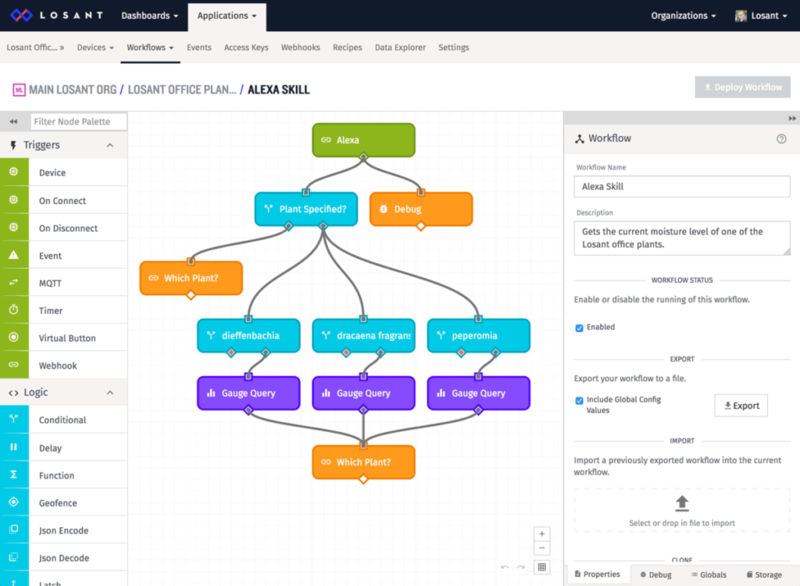 Blynk combines the data logging and dashboard display into a single service. 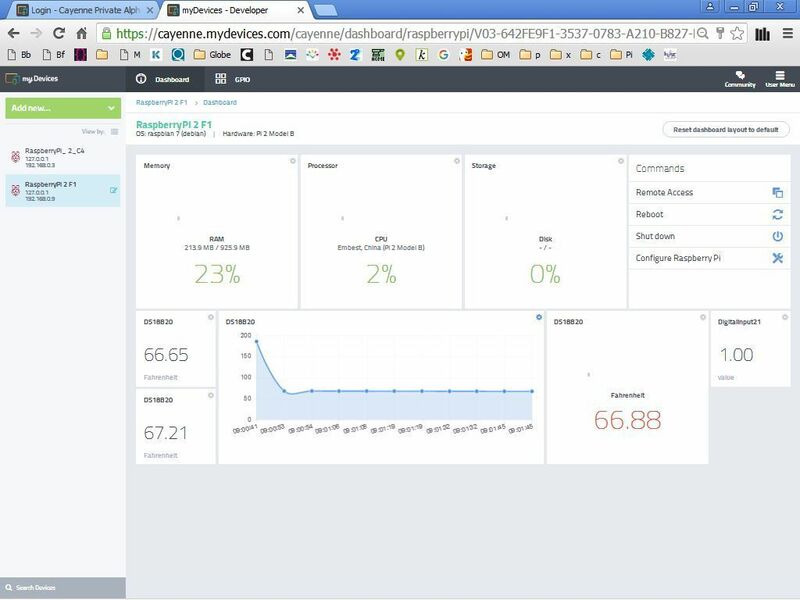 It also provides support for control over devices, in addition to displaying data received from them. 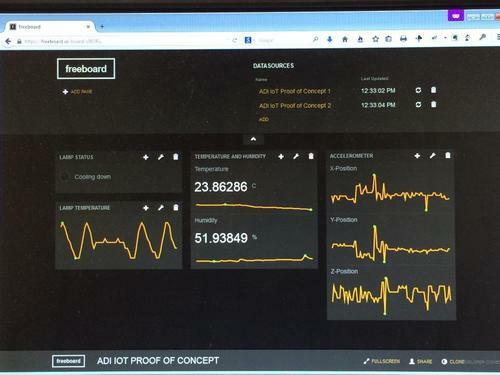 Along with Freeboard, it seems to be one of the most popular IoT visualization solutions. It’s easy to use, and attractive. My biggest complaint about Blynk is that visualization and control is accomplished entirely through mobile apps. There is no facility for viewing your data in a web page – everything happens on your phone or tablet. For some people that might be fine, but I strongly prefer a regular computer with a larger screen and easier control over a complex UI. The Blynk historical graph widget does almost exactly what I want, with an adjustable timescale showing anywhere from the past 1 hour to past 3 months. But the graph is tiny, and can’t be zoomed or enlarged. It also lacks a cursor feature to display the exact value from some time in the past – you have to eyeball the graph and estimate it. When the whole point of the temperature logger dashboard is to dig into the historical data, it’s disappointing. Blynk uses an “energy” metaphor that I find to be confusing and silly. Each type of widget added to your dashboard requires a different amount of energy, which must be paid for with an in-app purchase. I would prefer a more straightforward monthly subscription model, with the cost based on things like the number of dashboards and amount of data stored. Charging 2x the energy for a data field display with units vs one without units has no correlation to the developer’s actual costs, and makes me feel like I’m playing Farmville. 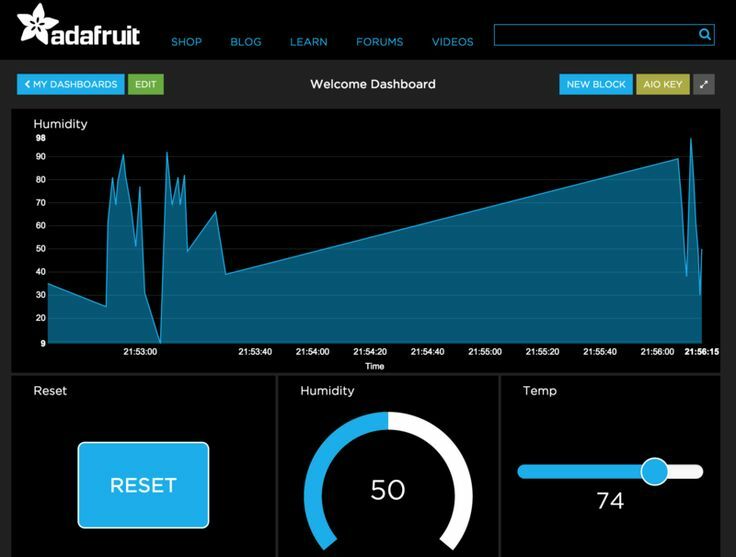 Adafruit.IO is technically still in beta, although it’s open to everyone and has been around for a couple of years. 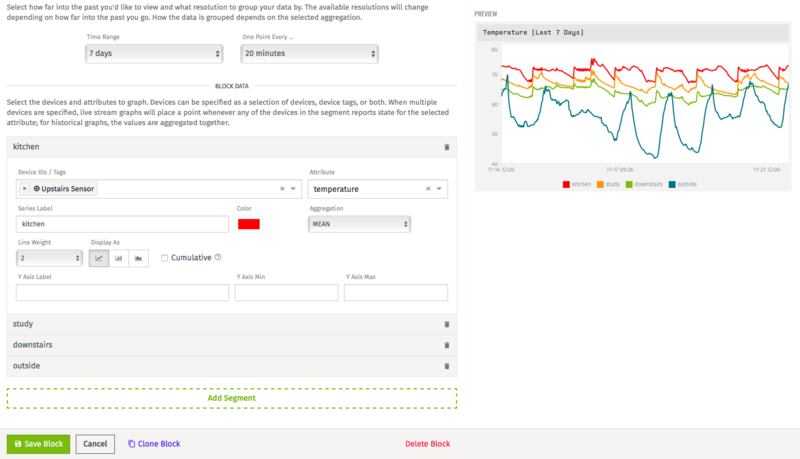 Like Blynk it combines data logging and display, and provides support for both data display and device control. But like Freeboard it’s web-based rather than mobile. Could this be the perfect solution? From my limited testing it looks promising. The historical graph widget works as expected, and my only gripe is that the time scale must be chosen when the graph is created, so you can make a “past 60 minutes” graph or a “past 24 hours” graph, but not a single graph with an adjustable time scale. I’m uncertain what the future holds for Adafruit.IO, or whether it’s still being actively developed and maintained. Since the service is completely free, and has been in beta for over two years, it has the feel of a project that was created with great enthusiasm but was left to languish when the developers moved on to something new. Assuming it doesn’t unexpectedly break or get shut down, it looks like a nice solution. 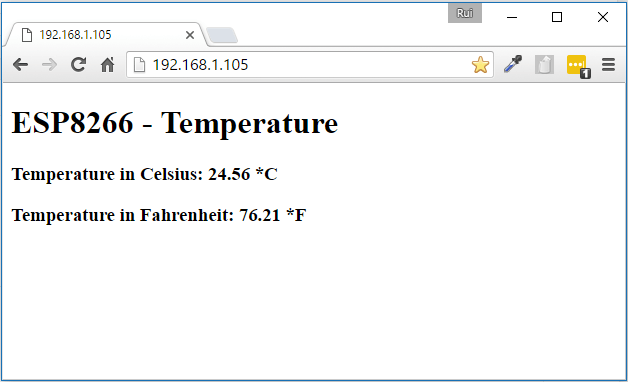 Cayenne is another web-based logger and dashboard like Adafruit.IO. It was recommended in a recent Sparkfun blog post, but I couldn’t find many examples of people using it. Unlike the other services I’ve mentioned, Cayenne appears to be an “app builder” whose goal is to avoid needing to write any code. 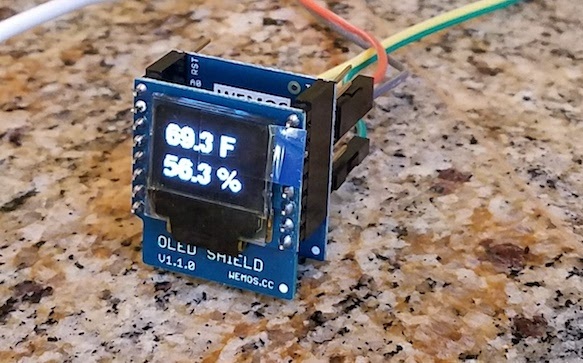 Instead you use a web GUI to define what type of microcontroller you’re using, what kinds of sensors, and how they’re connected, and then it spits out a complete sketch you can paste into the Arduino IDE. You can probably guess that I’m not too enthusiastic about this approach. Under the hood, the auto-generated code appears to use something very similar to the Blynk API for communicating with the Cayenne server. I stopped short after reading some Cayenne docs and videos, and never actually tried to integrate it. Maybe I should give it another try, as screenshots of its graphing functions look quite nice. If I can ignore the app builder and auto-generated code, and just use it as a normal API, it might be OK.
Thingspeak – Somehow related to MATLAB, and geared towards doing extensive analysis of the collected data. Might be OK? Most of the references I found were several years old, and I have the impression it’s been eclipsed by some of the newer alternatives. Emoncms – Looks somewhat promising, but I think it’s only for local server installs and doesn’t have a cloud service. Losant – Appears geared towards large scale businesses, not makers and home temperature loggers. Easy IOT – Didn’t make a great first impression – many typos in documentation, complicated setup compared to the other options. Analog.io – Minimal information on the web page, links to a Hackaday project that hasn’t been updated in a couple of years. Have you ever used these tools or others like them? I’d love to hear from you – leave a note in the comments. Further examination releaved the sad truth: the Mini took a direct hit when I fell, with all my body weight coming down on it, crushing it between my hip bone and the concrete. The plastic case was completely destroyed and smashed to pieces. The OLED glass was crushed, and part of the ribbon connector ripped off. The NEXT button was flattened and the spring mechanism killed. On the back of the Mini, the header pins were bent nearly 90 degrees over, the negative battery terminal was ripped straight off the board, and a bit of wood got stuck in the RTC crystal. No, it does not still work. I’m upset at having lost a prototype, since they take considerable time to assemble and the parts aren’t cheap. At least this makes a more interesting story than losing a prototype to a soldering error!